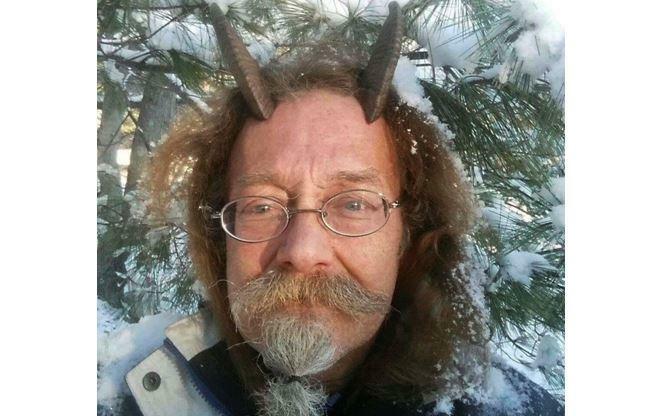 AUGUSTA, Maine -- An ordained Pagan priest finally has gotten the OK to sport goat horns in his Maine driver’s license photo. Maine resident Phelan Moonsong said that unless he’s sleeping or bathing, he always wears his goat horns, which serve as his spiritual antennae and help him educate others about Paganism. But Moonsong is questioning why he had to appeal his driver license’s photo to the state after explaining his religious beliefs to Bureau of Motor Vehicle staff. Plus, he adds, the horns didn’t obstruct his face. The Maine Secretary of State’s office said the state was not familiar with his choice of headdress and had asked Moonsong for more information to review the issue. A spokeswoman said the state allowed the goat horns because Moonsong cited their religious purposes and also because they didn’t obstruct his face. Moonsong said after he applied for an updated driver’s license in August and explained his religion to a motor vehicles employee, he was told to appeal his photo to the Secretary of State’s office. He said he provided more information to the Secretary of State’s office. But when he contacted the Bureau of Motor Vehicles in late November, he said he was told his ID was rejected -- which was news to him. “What I was requesting should have been accepted according to what was written in statute and in guidelines,” he said. But, he said, he was happy to receive his new driver’s license last week.